Mangaluru, Feb 06, 2019 : The police have initiated criminal proceedings against the owner of Unity Hall in Kallapu for allowing guests to the wedding to park their vehicles haphazardly on the road and causing a traffic jam that had lasted for over three hours on the Mangaluru – Kasargod highway a few days ago. 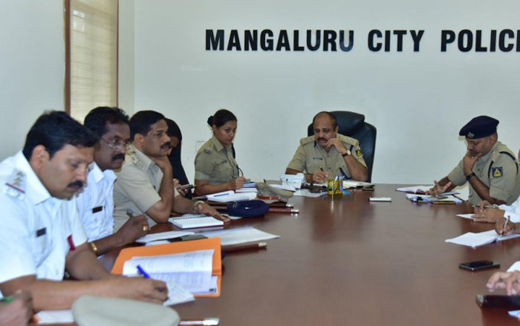 Residents of the city took to the phone with a vengeance and expressed their grievance about the three-hour-long traffic jam during the phone-in programme organised by the city police. More than a dozen citizens sought stringent action in order to send a terse message to all marriage hall owners. As resident after resident complained about wedding halls causing traffic snarls, Mangaluru City Commissioner of Police T R Suresh said they would also recommend to the Ullal local body to cancel the trade licence of the hall. A resident also complained that the Ullal police had refused to entertain his complaint against traffic block at Kallapu and had advised him to approach the traffic police. Suresh promised to sensitise the police personnel at the station. Residents also complained about bus personnel behaving rudely and buses not being operational during later hours. John B Misquith, in-charge assistant regional transport officer (ARTO), who was present in the phone-in programme, collected the details of the buses and promised to take action. Dilraj Alva and Rajavarma Ballal from the bus operators’ association urged the residents to submit specific complaints about bus routes and route numbers to help them pursue cases against them. The phone-in-programme also attracted some unusual calls including one resident urging the police to maintain dignity even during post-retirement, hinting the recent incident of retired police official causing an accident near Circuit house on January 26 injuring two wheeler riders. One of the clock atop the police commissioner’s office not working was also a complaint expressed by a citizen. The police commissioner assured to look into the complaints received during the phone-in programme.